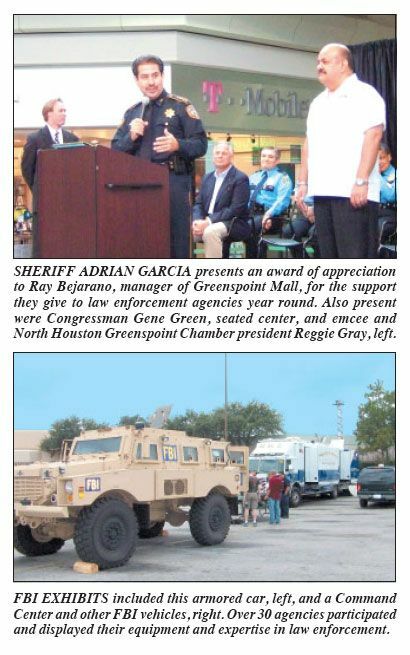 GREENSPOINT – The 24th Annual Law Expo, an exhibit of resources by over 30 Law Enforcement Agencies, was held at Greenspoint Mall this year. Last year the event had to be canceled, due to Hurricane Ike damage throughout the community. This year the weather was sunny and calm, and over 30 agencies participated in exhibits inside and outside the mall. The appreciative audience numbered over a thousand. In addition to displays, families could have their children fingerprinted, and their Child car seats inspected for safety. Inside the Mall, awards and appreciation certificates were presented, and government officials spoke about the quality of public safety agencies serving out area. The audience was also entertained by YMCA kids performing gymnastics, by McGruff the Crime Dog, and music before and after the presentations. The event was sponsored by the Greenspoint Mall, in partnership with the NHGreenspoint Chamber, Harris County Sheriff, and Houston Police. Popular exhibits included police helicopters, horse mounted officers, command centers from several agencies, SWAT equipment from several agencies, boat patrols, ESD equipment, Life Flight, motorcycle squads, fire and hazardous materials equipment, and more. Citizens could view exhibits, and in many cases sign up for classes or citizen participation. Generators donated to Aldine Y.O.U.T.H. Jed’s Hardware owners Weldon and Clyde Bailey in their blue Jed’s shirts, and Y.O.U.T.H. officials Shawna Roy and Sylvia Bolling, at the presentation of the two emergency generators at last week’s East Aldine networking luncheon. The 4000 watt Generators were provided by Northshore Power Systems, licensee of Honeywell Generators, and are meant to be used by the agency when emergencies turn the building into a shelter for the community. Pct. 2 Commissioner Sylvia Garcia held a ribbon cutting at the new Community Garden, at the Northeast Community Center on Bentley last Friday, Sept. 18th. 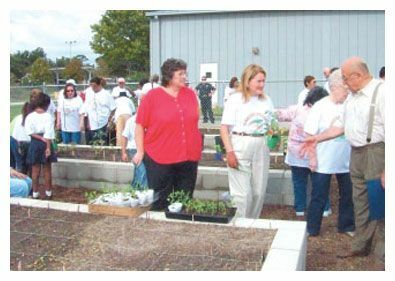 Present at the ceremony were seniors and young children that are participating in this ‘Garden Project”, part of a nationwide movement by ACHIEVE to foster healthy eating and lifestyles. ACHIEVE stands for Action Communities for Health, Innovation & Environmental Change and is sponsored nationally by the YMCA. As part of the emphasis on good health, Harris County Health Director Dr. Palacia was on hand for the opening, as well as YMCA officials including Mariana Rodriguez and some of the children from their ACHIEVE project. In her opening remarks, Garcia thanked those who had participated and helped in the project, including Master Gardener Lewis Mickler, Joe Dow of Dow Fence Company, Mike Harrison, and Pct. 2 staff Helen Timms, Lisa May, Debbie Copeland and many others. Also related to her ideas for a better quality of life for everyone, she noted, is the Boys & Girls Club in the NFL YET Center, next door at the Driver Center, and a Health & Wellness Clinic run at the community center. 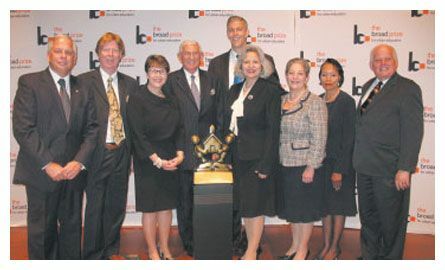 The Aldine Independent School District was named the national winner of the Broad Prize for Urban Education. The announcement was made in Washington, D.C. on Wednesday, Sept. 16, at the U.S. Capitol’s Congressional Auditorium. On hand for the announcement were Aldine ISD Board President Dr. Viola M. Garcia, Vice-president Dr. Alton Smith, Secretary Rose Avalos, Assistant Secretary Rick Ogden, Board Members Merlin Griggs, Marine Jones and Steve Mead, Superintendent Dr. Wanda Bamberg, and Priscilla Ridgway, assistant superintendent of curriculum and instruction. Also on hand for the announcement was TSTA representative Carolyn Milton. Joining Mr. Broad for the announcement were Secretary of Education Arne Duncan, U.S. Senator Tom Harkin and U.S. Representatives Gene Green, George Miller, and John Kline. • Outperformed other similar Texas districts. In 2008, Aldine outperformed other districts in Texas that serve students with similar family incomes in reading and math at all grade levels (elementary, middle and high school), according to The Broad Prize methodology. • Demonstrated better performance by racial, ethnic and income subgroups. In 2008, Aldine’s Hispanic and low-income students achieved higher average proficiency rates than their state counterparts in reading and math at all school levels. In addition, Aldine’s African-American students achieved higher average proficiency rates than their state counterparts in math at all school levels and in middle and high school reading. • Closed achievement gaps. Despite the relatively small size of achievement gaps between its low- and non-low-income students, Aldine still made progress between 2005 and 2008 in closing income gaps over time in reading at all school levels and in elementary and middle school math. Aldine also narrowed the gaps between its African-American students and the state average for white students between 2005 and 2008. For example, during this time, the gap between these two groups narrowed by 14 percentage points in middle school math. • Broke the predictive power of poverty. Family income level is typically a strong predictor of school performance nationally. However, Broad Prize data analysis shows that school-level poverty does not appear to be statistically related to student achievement in Aldine at any grade level in reading or math. High student achievement is just as likely in a low-income Aldine school as it is in a non-low-income school. • Demonstrated strong district-wide policies and practices. The district’s comprehensive curricular and instructional system sets clear, rigorous expectations for teachers and principals and provides easy access to instructional resources and student performance information. In addition, Aldine regularly monitors progress toward goals, ensures that staff and resources are focused on district-wide priorities, gives principals budget autonomy yet holds them accountable and aggressively recruits high-quality teachers. The Broad Prize for Urban Education is an annual award that honors the most outstanding urban school district in the United States that has made the greatest improvement in student achievement while reducing achievement gaps among ethnic groups and between high- and low-income students. 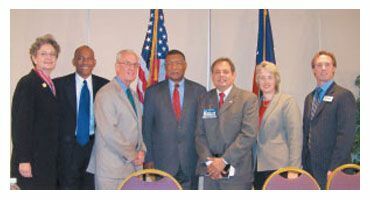 The Houston Community College Board of Trustees adopted revised service plans for North Forest and Spring Branch school districts August 20, 2009. The proposed HCC service plans for both the Spring Branch and North Forest communities represent a commitment by HCC to expand programs and partnerships, cut tuition, increase services and improve access to higher education. The HCC Board of Trustees also unanimously adopted an order to call a special election to be held Tuesday, November 3 for the annexation of the Spring Branch and North Forest communities into the HCC district. Community-based groups, volunteers and students successfully petitioned for annexation in May and June. 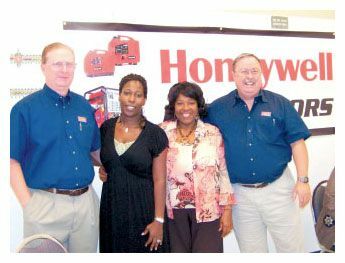 HCC has been serving Spring Branch area residents since 1986. 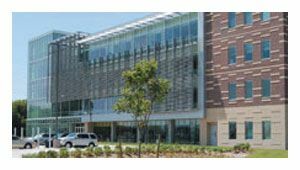 The Spring Branch Campus at 1010 W. Sam Houston Parkway North represents a $35 million capital investment, creating a new set of academic, workforce and continuing education facilities for the community. In addition, HCC spends $16 million in annual operational investments. The Spring Branch Campus will be a catalyst for redevelopment in the area, following the Memorial City/Memorial Herman project and the new City Centre development. HCC has been serving North Forest area residents since 1971. Eight-hundred North Forest residents attended campuses that serve the community during the 2007-2008 academic year. The highest percentage impact was represented by North Forest high school students who enrolled in Dual Credit courses. Since 2005, residents of North Forest have saved $350,000 in HCC Board approved waivers for North Forest juniors and seniors enrolled in the Dual Credit program. Over 1,137 courses have been offered for students who completed as many as 12 semester credit hours that are transferable to a university. HCC currently employs 72 residents of the North Forest community. GREENSPOINT MALL and Al’s Formal Wear and Alfred Angelo Bridal held a BRIDAL EXPO last Saturday, September 12th, with many fashions exhibited, as seen above. These are still available at the stores in the Mall. The college will use the acreage to build a new 50,000 square foot facility envisioned to be a center for workforce and academic preparation, economic and community development, and a focal point for citizenship training for area residents. The center will be designed to handle a student capacity of up to 3,500. The additional land will allow long-term expansion when it becomes necessary. Administrators also foresee a center that will include a child care component and a Small Business Development Center. Texas State Representative Sylvester Turner, who lives and serves the communities of Acres Homes and Aldine, has been a long-time partner and supporter of Lone Star College initiatives. “Meeting today’s educational needs–while trying to shape and plan for the future–involves the development and maintenance of mutually constructive community partnerships. This new center and land purchase is a major positive step in the revitalization of the area,” says Rep. Turner. The new center, yet to be formally named, will include several significant components including the relocation of LSCCarver Center’s Early College Program–created in partnership with Aldine ISD and LSC-North Harris–to the new center, as well as the relocation of LSC-Carver Center’s college credit classes currently offered to the general community. The facility will provide room for additional class offerings. Approximately 30,000 square feet of the new center will be designated for academic preparation including traditional offices such as admissions, advising, counseling, financial aid, testing and administrative support; college preparatory programs and classrooms such as Adult Basic Education (ABE), GED, ESL and college preparatory classes in Reading, Writing and Math. In addition, an array of year one and two college-level classes will enable students to move for ward toward a bachelor’s degree. Several programs that lead directly to area universities are also under consideration. The cornerstone of the facility will be a 20,000 square-foot construction trades training center offering workforce certificates and degrees in selected programs such as heating and air conditioning, dry wall, sheet metal, sheetrock installation, and welding. “The college is working hard to meet the needs of greater Houston economy by providing local residents with an educational pipeline leading to meaningful jobs and livable wages in a relatively short period of time,” says Dr. Head. According to Dr. Head, the greatest challenge–aside from bricks and mortar and equipment–is providing long-term financial assistance to students and workforce training participants who do not qualify for federal and state funding. Financial support is the difference in residents succeeding or failing due to non-academic factors. For example, students on average will need about $3,000 for welding equipment and supplies, $1,000 for books and supplies in the HVAC program, and similar costs for other programs; others will need help with transportation and child care expenses. “With this new land purchase in Aldine, Lone Star College System continues its commitment to our service area, which includes developing accessible and seamless educational opportunities to help strengthen our communities,” says Dr. Richard Carpenter, Lone Star System chancellor. Charges have been filed against one of three suspects believed responsible for the fatal shooting of a man at the Siesta Food Mart, 390 Aldine Bender about 10 p.m. on Aug. 31. A second one is in custody, according to HPD. One suspect, Dontreal D. Brown, 18, is charged with capital murder in the 184th State District Court. Brown, currently in custody on an unrelated aggravated assault with a deadly weapon charge, is accused in the killing of Joe Fernandes, 54, of Sugar Land. Fernandes suffered a gunshot wound and was pronounced dead at the scene. Another persons of interest, Vondra Joseph, 20, is being questioned. 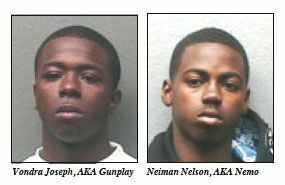 Neiman Nelson is wanted for questioning in this case. HPD Spokesman Victor Senties said that a person of interest was interviewed on Sept. 8, but that no additional arrests had been made as of press time. HPD Homicide Division Senior Police Officers T. W. Miller said that three unknown male suspects dressed in dark clothing entered the Siesta Food Mart at 390 Aldine Bender and robbed the store clerk, Fernandes, at gunpoint. At some point during the robbery, one of the suspects fatally shot Fernandes. The three suspects then left the store and got into an older model, gold or tan four-door vehicle parked on the side of the store in the 15900 block of Cotillion Drive. The suspects were last seen driving southbound on Cotillion Drive. Anyone with information on the whereabouts of the wanted male is urged to contact the HPD Homicide Division at 713-308-3600 or Crime Stoppers at 713-222-TIPS. NORTHEAST HOUSTON – The Chamber luncheon was packed for a presentation of their qualifications by the four leading candidates for Mayor of Houston. The election will be held in November, but already the candidates have been to over 40 forums to garner support and votes. Last Friday’s luncheon was no exception, with over 100 chamber members and guests listening intently as the four hopefuls gave 15 minute presentations of their platforms and qualifications. The program was held at the DoubleTree Hotel on JFK Boulevard, and was moderated by Attorney General candidate Barbara Radnofsky, and emceed by chamber president Reggie Gray. Mayoral candidates included Peter Brown, Gene Locke, Roy Morales, and Annise Parker. Although billed as a debate, it really was more of a campaign speech by each of the candidates, with no formal challenges or rebuttals. This was partially due to time constraints, and followed the agreed upon format. The candidates were asked to address three major questions: 1) What experience do you have to be mayor? and 2) Do you support the work of the current city administration? and 3) What do you propose to specifically help the North Houston Greenspoint area? Each speaker was to answer these points in a 15 minute period. There was not time for questions, rebuttal or additional discussion due to the lunch hour time. The first speaker was Peter Brown. He emphasized his skills and experience as a small businessman, an architect and planner, for over 30 years. This has taught him how to hire and retain talent, he said. He also developed marketing skills that would be useful to the city. His architecture practice included the design of many urban environments, both city-wide and world-wide. His next experience has been as a city councilman for two terms, working with the administration of Mayor White. Here he learned how important basic city services are, such as ditches and sidewalks, he said. Brown was in support of the current administration, but would put more emphasis on expanding police, and economic development. He also wanted to expand the transit system, and the light rail network. His vision for the future, or “Blueprint” as he named it, calls for tougher policing and better technology. For North Houston, he wants to extend the North Light Rail line to the area, and reduce traffic congestion. He sees the area as Houston’s “Gateway” and thinks we should emphasize that. He noted that a new Public Safety Center is underway in the area, and thinks it should include a city hall annex, fire, and police. Next to speak was Gene Locke. He emphasized his work as an attorney, and in government service with Mickey Leland and Mayor Bob Lanier, as city attorney. He currently serves as an attorney for the Harris County Sports Association, and the Port Authority. He cites his own hard work, and success in Houston, as an example for others to learn encouragement. He does not criticize the current administration, but says he will emphasize a hands-on approach, and more non-partisan participation. He feels that city hall could use a more business-like approach. Roy Morales was the next speaker. His experience includes 23 years as a team leader in the Air Force, coordinating a major project with NASA and the AF. He also is the chief technology officer for the Harris County Office of Emergency Management, he said. Morales spoke of tax relief, better control of the city budget, and help to retain local businesses as a way to foster economic growth. He also saw a new soccer stadium as a catalyst for development on the east side of the city. In his comments on the current administration, he said he wanted a cabinet level position representing education, and more work to keep students in school, and more emphasis on After School programs. To help North Houston, he wants to extend the Light Rail to the Airports, make METRO more responsive and transparent, offer tax relief, and foster new business in the airport area. He wants to emphasize Houston as an Energy capital, not let places like Dubai claim this. She will continue many of the policies of the current administration, but emphasize a collaborative leadership style. Only a few minutes were left at the end of the luncheon for one question about improving HPD, but most of the answers had already been covered in the presentations. Next month’s luncheon will be a State of the County report by Judge Ed Emmett on Oct. 1. The North Houston Greenspoint Chamber of Commerce will hold their annual Starlight Ball Gala on Thursday night, November 5 at the Doubletree Hotel on JFK Boulevard. 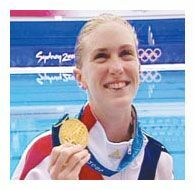 The honored guest will be Laura Wilkinson, Olympic Platform Diving Gold Medalist. The Starlight Ball is an annual fundraising event, featuring a Dinner, Awards Ceremony, Silent Auction and Raffle. A cocktail reception will be held from 6pm to 7pm, and the main Gala will take place from 7pm to 10pm. Reservations can be made by contacting the Chamber office at 281-260-3163, or yhamlin@nhgcc.org. Laura Wilkinson, Houston resident and the featured speaker, has a website with the following information. Beating what many said were impossible odds in one of the biggest upsets in Olympic history, Laura, starting in eighth place and with a broken foot, came from behind to win the 2000 Olympic platform gold medal. Laura has also won the 2004 World Cup and the 2005 World Championships, becoming the only woman in history to win all three coveted world titles in platform diving. Along the way, she has won 19 US National Titles, been voted by the American public the 2000 US Olympic Spirit Award winner and was nominated for an ESPY award.